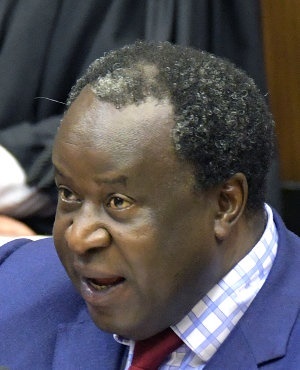 South Africa is supposed to be a secular state, but one can perhaps forgive Tito Mboweni, the Minister of Finance, for quoting numerous biblical verses in his 2019 Budget Speech. After all, South Africas fiscal situation is enough to make many people hope for divine intervention. The 2019 budget numbers show that the past year has been no exception to some new normals that have been established in South Africa. These include slow economic growth, state-owned enterprises requiring unplanned financial support, failing plans aimed at stabilising national debt levels, and tax revenues significantly lower than forecast. All were present in this years budget. Economic growth forecasts have been revised down from a paltry 1.7% to 1.5%. Revenue collection was R42.8bn lower than expected in the 2018 Budget. And Mboweni is promising to stabilise gross national debt slightly above 60% of gross domestic product in 2023. This follows many failed promises in previous budgets to stabilise gross national debt below 50% of GDP. The reasons for these failures are largely to be found outside of the Treasury and Ministry of Finance. Tax revenue shortfalls are partly due to low economic growth and problems in tax administration. In addition, the South African Revenue Service has been clearing a backlog in refunds that had accumulated under the previous commissioner. On top of this, the financial and operational crisis at the troubled power utility Eskom has necessitated some drastic measures. The budget has to aim for fiscal decisions that serve the public interest and maintain the stability of public finances. So did the proposals tabled constitute a good response to the situation? And what are the implications? Mboweni continues to walk a precarious tightrope. The budget is likely to be well-received by the private sector because it wasnt asked to make any meaningful sacrifices while some sectors can look forward to new opportunities. Individual citizens and the state itself will bear the brunt of the most difficult decisions. The only real defence for this asymmetry is a belief that wooing business and potential investors will lead to the economic growth and job creation needed to emerge from the current crisis. But there is no guarantee of that, and the likely negative effects on citizens have arguably been given too little attention. Eskom is the main factor driving the most significant proposals in the 2019 Budget. Mboweni confirmed President Cyril Ramaphosas announcement that government intends to split Eskom into three parts (generation, transmission and distribution). Whats new is that the budget suggests transmission will be the first to be formed and private sector investors invited in. From a public finance point of view, the critical announcement is that Treasury will be providing Eskom with financial support of R23bn a year over the next few years (and possibly longer). There are no major changes to tax policy. But the government will try to get more revenue (about R10bn in 2019/20) from individual taxpayers by not adjusting tax brackets upwards for inflation. It will also increase taxes on alcohol and cigarettes. Tax on fuel will also go up and will now include a carbon tax. The 2020 Budget will announce measures to raise an additional R10bn in tax revenue. To try and limit the effect of Eskom support on overall government spending (and debt), the budget proposes to cut other areas of public expenditure by R50bn. The proposal is that this will be done through reducing the number of public servants and cutting funding to programmes that have under-spent or under-performed. Finally, the budget proposes to raise the amount set aside for unexpected spending to R13bn for 2019/20 to account for possible financial support to other state-owned enterprises. In line with an earlier policy, the Treasury has said that it ultimately intends to sell public assets to offset such support. These, however, arent listed. Pouring money directly into Eskom in its current form is like pouring water into a sieve. Past evidence certainly seems to support this claim. So why another R23bn per year for a failing enterprise? The main reason is that the utility supplies the country with power. In addition, a lot of Eskoms debt is being guaranteed by the Treasury. This means that the utilitys financial and operational problems are now the nations problems. Besides the dramatic evidence provide by power cuts in recent weeks, individuals citizens have also been affected by dramatically increasing electricity tariffs. Past efforts to resolve Eskoms problems have clearly failed. It remains to be seen how Ramaphosa and Mbowenis promise that it will be different this time will turn out. And while the general case for restructuring the electricity sector is strong, it is debatable whether doing that now will improve or exacerbate Eskoms crisis. Support for Eskom will be funded by cuts in spending elsewhere. A major component is a reduction of R27bn in salary payments. Treasury has been encouraging reductions in the number of public servants for some time: the budget shows that the number of employees declined by 16,000 at national level and almost 50,000 at provincial level between 2015 and 2018. The Treasurys plan for further cuts involves offering early retirement packages. The hope is that about 30,000 (out of 125,000) public servants aged between 55 and 59 will accept the offer. A serious concern is that the move might lead to the most competent public servants leaving. And that recent cuts have harmed state capacity and service delivery. These are the kinds of issues that will need to be watched closely if Treasurys proposed cuts are accepted by Parliament. As always, the Budget contained some proposals that are progressive but constitute an almost trivial level of expenditure. There is R157million in 2019/20 for free sanitary pads for learners in poorer schools. And in an attempt to respond to concerns about the increase in VAT to 15%, there will be VAT zero-rating on white bread, cake flour and sanitary pads. In addition, the salaries of members of parliament and provincial legislatures, along with some state executives, will be frozen. Meanwhile, other major policy issues from previous years have already faded into the background. Free higher education will be continued, with spending rising from R27bn to R40bn in 2021/22. But this major policy change has already been relegated to a paragraph of information with little detail on how funding decisions are being made at the level of individual students. Mbowenis strategy was clearly to downplay the negative effects of expenditure cuts on the one hand, and on the other to pin the countrys hopes on improvements in economic growth, revenue collection and the finances of state-owned enterprises. If none of these happen, no amount of biblical verses will shore-up the nations finances and economy. Sen Mfundza Muller, Senior Lecturer in Economics and Research Associate at the Public and Environmental Economics Research Centre (PEERC), University of Johannesburg. Views expressed are his own.